We decided to organise ourself as 2 by 3 as a structure within which we could explore similar interests in sculpture, objects and presentation. This resulted in our first show Death of Intention which explores the roles of objects and space in how we experience and interpret the world written about by Walter Benjamin. The fluid process of producing this show resulted in a open and new installation which feels autonomous and optimistic. The time to curate and install together has given it the feel of a residency- an event which is often characterised by noticing the luxury of being able to prioritise and focus on your practice, slightly removed from the demands and distractions of daily life. Over the course of four days we had two days to initially install our proposed work, and the remaining time allows for experimentation and exploration along the themes proposed by Benjamin, around the themes of barriers, obstacles, agency and negotiating space. Alia Pathan works predominantly in time-based media, presenting thoughtful digital film and media installations which explore the deapths of human experience and connection. For Death of Intention she has thought about the deliberate construction of an apparatus we can use to experience her media work. Materials and construction are common themes in all the work presented in the space, and this work Peter, Pixel & I, uses carefully manufactured structures and objects to invite us to move around the work, explore as much as we dare. I can avoid looking at a film of a medical procedure if I stand to one side, choosing to be selective in how I look at it, mimicking the official policy towards the market in such procedures during the soviet era which informed this work. In thinking about the official ‘blind eye’ which was turned to the doctors and ship which worked in international waters, the artist has also produced a silk flag which simultaneously interrupts the space and provides a backdrop to the films. The luxurious surface invites me in as much as the printed design of eye operations repels me. In the next space the heavy contrast of cast iron sits on the back wall, spelling out the image of a cat in raised characters which could be read blind. The Cyrillic ‘shhhh’ form in the Center, once I’d had it translated for me, suggests the silent complicity of the operation of duel systems. Bex Massey is skilled painter of photorealistic images, who has always considered modes of display beyond the sole canvas. In the past she has used leaking daylight, objects as props, and juxtapositions with mass produced materials to support her paintings. For Death of Intention she has not dispensed with paint altogether, but here it has taken a supporting role, used to highlight physical elements which allow for the themes to prevail. The combination of crafted objects with organic elements gives the work the same slightly precarious sense seen in earlier works. The main space holds two pieces, ‘Seasonal sculptures’ number one still employs abstract canvases, balanced one on the other here, as a backdrop to a cast object. The painted reproduction of a pineapple is topped with a regular a top sliced from the fruit. 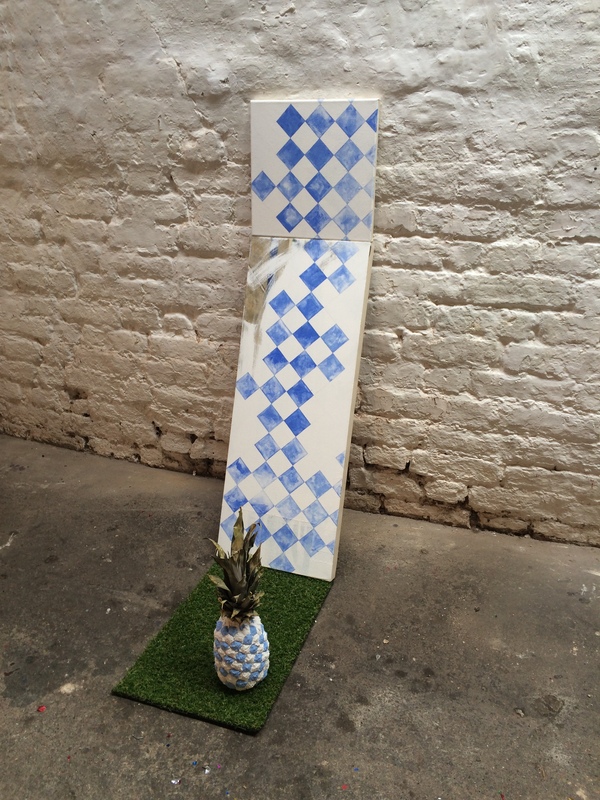 The pineapple is colour and pattern- matched to the canvas, whilst the colour of the pineapple top is reflected in the section of artificial turf which supports all parts. This limited palette ties the selected objects together, somehow making sense of the variety. The slender vertical presentation gives a poetic sweep to the assembly. Seasonal sculpture number 2 consists of a junior school chair supporting a slice of watermelon. The chair has been restored and repainted in white on one side, fluoro pink on the other. The pink is reflected in the flesh of the watermelon which has been remade whilst still presented in a piece of cut peel. The organic elements in these Seasonal Sculpture series lend a sense of tension and termporality, making me want to cherish the looking while I can, before they topple or rot away. The simple bright colour on the child’s chair lends an element of playfulness to the work, which is tempered for me by the faux offering of the fruit. The sense of dashed hope of nourishment continues in the next room, where chips are referred to by potted yellow flowers. 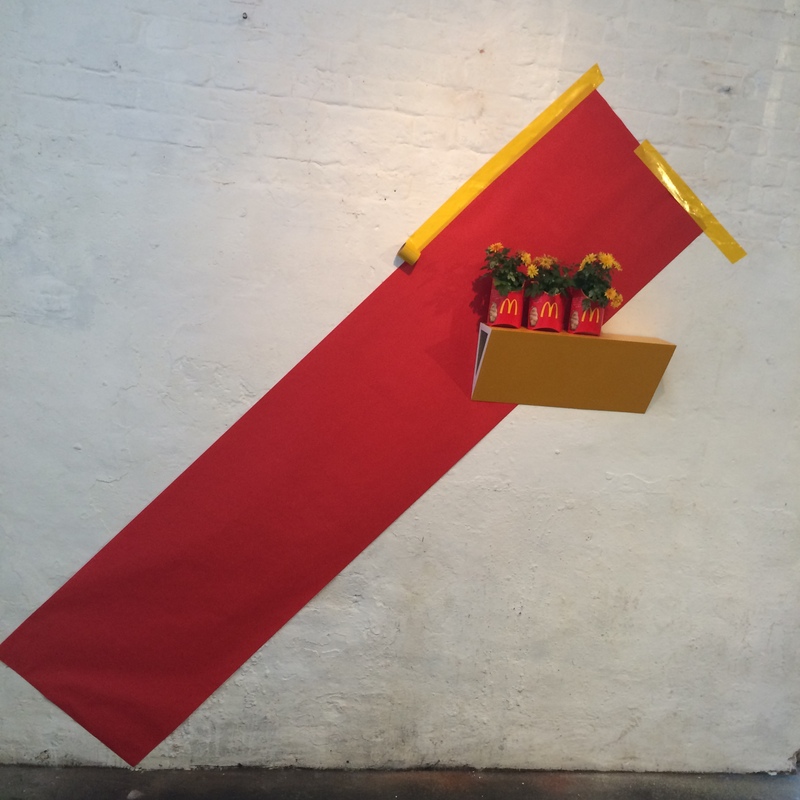 They are potted in McDonald’s fries pots, supported on a crafted shelf against a slash of red and yellow on the wall. The movement of the first piece is here, and the simple palette too. These sculptures are a departure for the artist, yet the unmistakable lineage is plain to see, which I find really interesting. How this happens and what we do with it is one of the questions we asked of ourselves in creating this show. 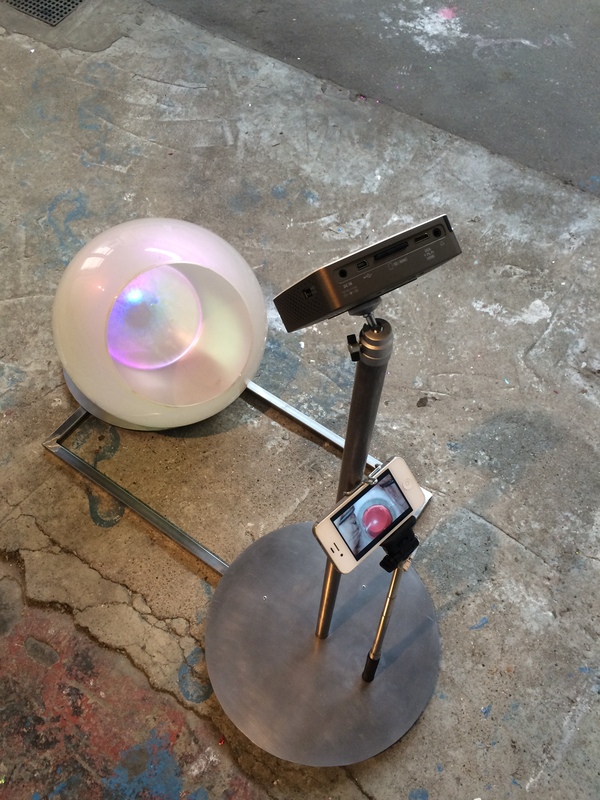 Drawing work and ideas out of the usual métier into something more 3D, sculptural, interactive, invites a different experience from the viewer, just as it is a new way of thinking and working for the artist. 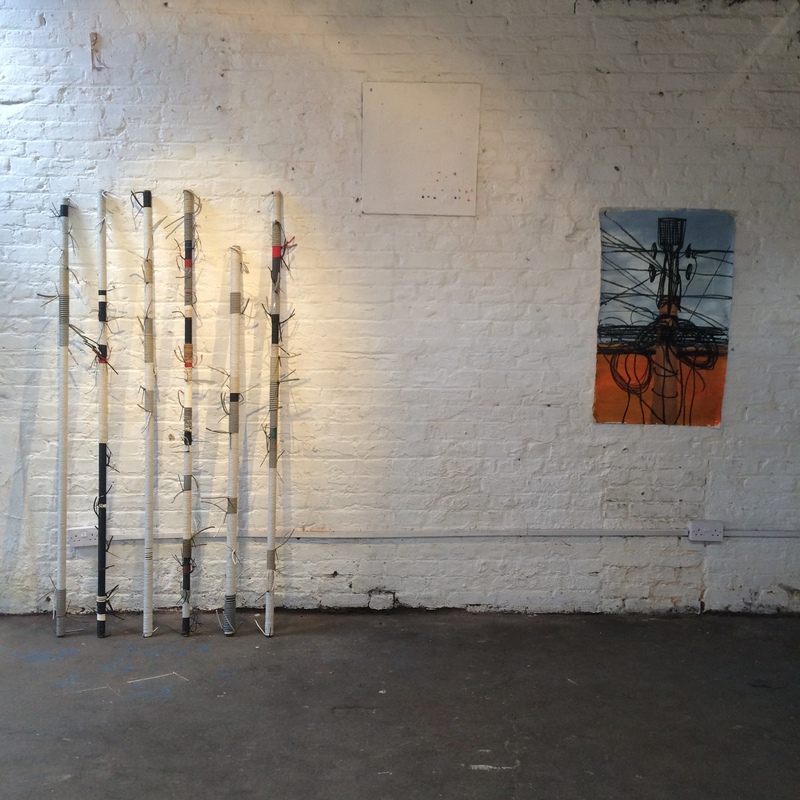 Personally, the work I presented seems to be stretching my practice from both ends: the multiples which make up AQI (air quality index) are bookended by a working circuit of power cable with exposed bulbs and contacts in one direction, and by gestural canvases in the other. The circuit is one of the most quiet, distilled works I have shown. It’s fascinating watching how it is interpreted, as I try and gauge if it is pared back enough, or too much… The concept seems to be communicating itself, with the audience spontaneously approaching and activating the work. The cooperation and interaction required to complete the circuit is a new explicit element, whilst the execution of the basic materials themselves keeps the focus on the object/materials themselves. The oil and wax paintings are physical interpretations of some of the imagery I collected during my residency in Beijing last September with Red Mansion. The abundant stimulation and input of all senses which I experienced will continue to feed my work, but in flattening it into two dimensions, I am distancing myself from what was an intense physical and emotional period, and this allows me to better process it objectively.